Today we're debuting giveaways on MacRumors, a new feature that will see us partnering up with companies to give away products to our readers. You can expect to see giveaways from us on a regular basis throughout the year. 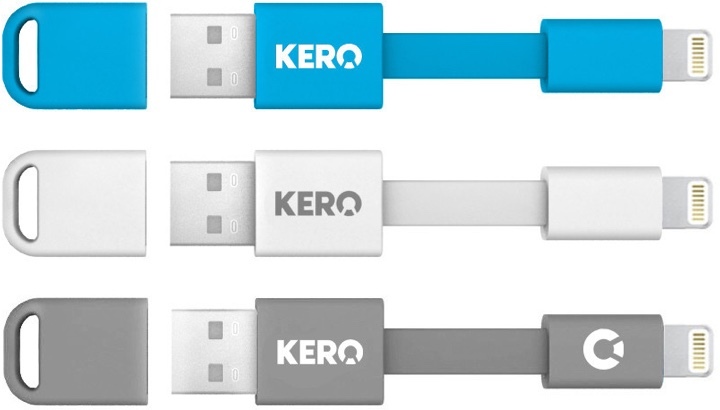 For our first giveaway, we've partnered up with Kero, a company that makes a few awesome accessories for iOS devices, like the Nomad Lightning Cable. The Nomad cable is a three-inch Apple-certified Lightning cable that comes equipped with a USB cap that attaches to a key ring or clip for portability. If you've been a long-time MacRumors reader, you might recognize the Nomad, because we've covered it on a few occasions since it first originated on Kickstarter in 2012. There have been several iterations of the Nomad cable since then, and it now comes in three colors: white, blue, and gray. We're giving away 50 Nomad Lightning Cables. You can enter to win using the Rafflecopter widget below. You'll need to enter an email address, which we'll only use to contact you if you've won (your email address will never be provided to a third-party). Social media accounts are not required to enter the contest, but following us on Twitter or Facebook or subscribing to our newsletter can give you a chance for extra entries. You must be 18 or older to enter and located in the United States. a Rafflecopter giveawayThe contest will run from today (2/20) at 10:00AM until next Friday (2/27) at 10:00 AM Pacific Time, at which point we will notify the winners, which will be chosen randomly. Winners will be able to pick a Nomad Cable in the color of their choosing, and it will be shipped out for free. Winners will need to respond to our email within 48 hours, or another winner may be chosen. Unfortunately, the U.S. only restriction is due to the varying laws covering giveaways around the world. Some countries ban them entirely, some require an element of skill, some require selection by chance, some have language requirements (looking at you, Quebec), etc. In short, it's a legal nightmare to even attempt to comply with laws in all of these countries, and we simply don't have the resources to manage it. We really wish we could, because we know we have many loyal readers around the world, but it's just not feasible. You'll see similar policies on many other major media sites that do giveaways. Worldwide reader base but only available in the USA...shame, oh well. Can I please ask why it's US residents only? Macrumors is doing a nice thing that they don't have to. Unfortunately, circumstances outside of their control limit their scope of giveaway. Don't blame them or complain, though I do understand everyone's disappointment. Whether you're eligible or not, this is still a nice thing they're doing. Maybe one day there will be more harmonious global rules, but right now they're doing the best they can. "You must be 18 or older to enter and located in the United States." Here we go with another bitter foreigner's complaining post without actually understanding the legal restrictions in place. So it shouldn't let you enter. Also if competition law is that complex then maybe it would be better to do no competitions at all, least that way no one is pissed off. Or they could do the give away and no one could be pissed off. I really don't understand the hate-- they're giving away a couple hundred dollars worth of swag and you have a the smallest fraction of a percent chance of scoring one yet it is worth this much of your time to whinge about it? Do you get like this when the news covers a Presidential election you can't vote in? You get quality health care and decent beer, and we get a 50 in a million chance to hang a bit of plastic from our keychains. Remind me why you're complaining? Why stop at kicking the foreigners off macrumors? Kick the foreigners off the internet!